The Be A T.I.G.E.R Field day is an annual event created by former Clemson volleyball coach and community service coordinator, Linda White. Clemson student-athletes put on this event each year during the spring semester. Be A T.I.G.E.R Field Day focuses on games and activities to teach the T.I.G.E.R character education program. Each letter in the word ‘Tiger’ stands for a certain character trait that is important for young children to understand and practice. “T” stands for teamwork, “I” for integrity, “G” for gratitude, “E” for education and “R” for respect. The event is free for all children (grades K-8), with student-athletes from all of Clemson’s athletic teams simultaneously demonstrating character and giving back to our supporters. We encourage parents to attend the event with their children, signing them up at registration and then helping to lead them to each individual station. Attendees receive Be A T.I.G.E.R t-shirts and other prizes throughout the field day. The children and their families are also invited to the Spring Football Game, which occurs in the afternoon after the field day ends. 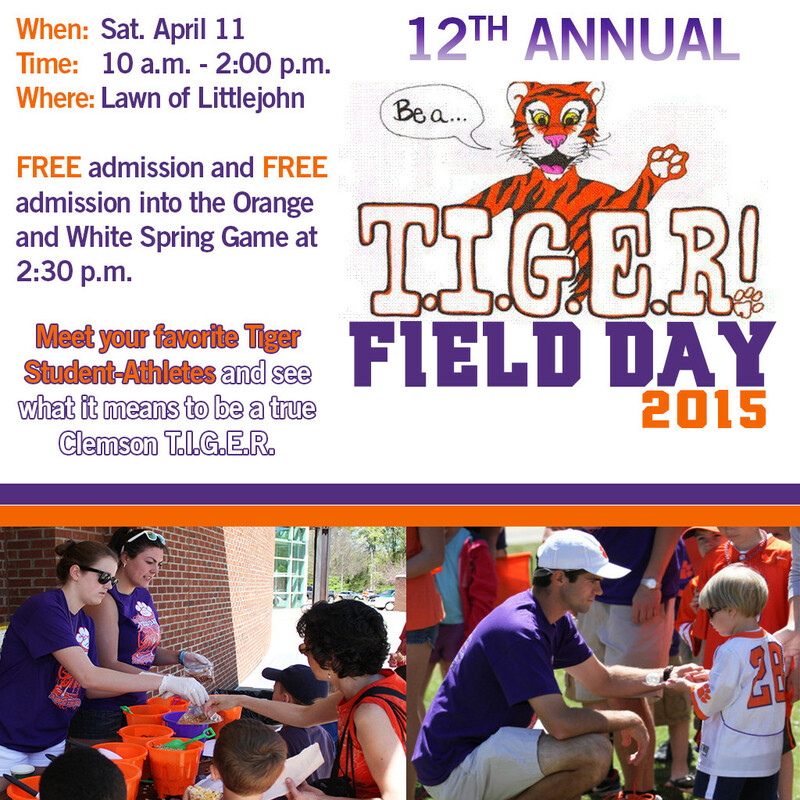 This year’s Be-A-T.I.G.E.R Field Day will take place on Saturday, April 11th, 2015 with the Clemson Spring Football Game occurring in the afternoon. This year’s field day will begin at 10 a.m. and end at 2 p.m. The 2015 Be A T.I.G.E.R Field Day coordinator is Kerianne Pacheco, a member of the Clemson Rowing team. If you have specific questions about the event, Kerianne can be reached at: kerianp@clemson.edu.